When it comes to increasing space in a warehouse, it is widely accepted that building up is just as good (or better) than expanding outward. The most common method for doing this is with a mezzanine. A mezzanine is an intermediate floor inside of a building, usually open and not walled off. There are a few different types of mezzanines; including stick built, fiberglass, and rack-supported. In general, the two most common types of mezzanines are cold rolled and structural steel. Understanding the differences in the way the two types of mezzanines are manufactured is crucial to ensuring you choose the right product for the job. Cold rolled refers to the method of bending sheet metal into “c” channel to use as the understructure of the mezzanine floor. These cold rolled pieces attach to the tubular steel or tapered columns and provide the “beams” that support the floor. 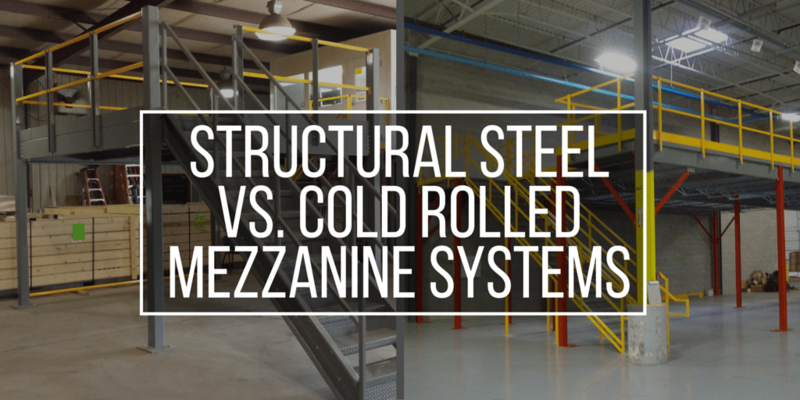 Cold rolled has two major benefits over structural steel mezzanines. First, the material is much lighter than structural steel and therefore less expensive to ship. This usually means there is also less equipment needed to erect the structure on site. Second, cold rolled steel can be pre-galvanized; offering a substantial savings over hot dipped galvanized, stainless steel, or aluminum mezzanines. A disadvantage of cold rolled steel mezzanine systems is the very limited column spacing (usually 10’ – 15’ max). They are also unable to reach the high live loads or heavily concentrated point loads that can be accomplished with structural steel mezzanine systems. Structural steel mezzanines are constructed of hot rolled structural I-beams which connect in a post-and-beam manor to tubular columns or I-beam columns. Open web bar joists are then used to construct the sub-floor support. While structural steel mezzanines do have a higher dead load than cold rolled systems, they also offer major advantages. The most commonly required benefit of structural steel is greater column spacing. Instead of the limited 10 to 15 feet achievable with cold rolled, structural steel mezzanines can have column spacing over 25 feet as well as load ratings well over the standard 125 psf. This means when using a structural steel mezzanine system, more material can be stored in a smaller area – with more space for maneuverability underneath. Both types of mezzanine systems can be finished with wet paint or powder coated. Cold rolled systems can be pre-galvanized whereas structural steel must be hot-dipped in order to become galvanized. Decking options for both systems include: B-deck and plywood, bar grating, and plank decking. With structural steel, however, there is the added option of either finishing the floor in concrete or with diamond plate. The last major comparison point between the two systems is price. Cold rolled systems will tend to be cheaper (partly due to less freight cost), but offer fewer options and have lower column spacing and load rating maximums. Conversely, structural steel tends to cost more; but with more options and the availability to add more weight as situations arise in the future. You should carefully assess current and future needs before choosing either option.